In the spirit of Looking Backward, pointing you to this letter featured on the Paleofuture blog, written by Benjamin Franklin to the Reverend John Lothrop of Boston, May 31, 1788. 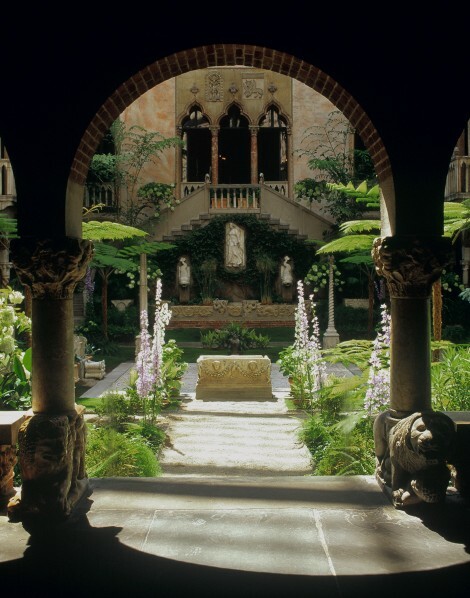 The opening lines of The Memory Palace of Isabella Stewart Gardner Museum. It’s an odd alliance at first glance. The Boston Preservation Alliance and Occupy JP have united to oppose demolishing the “Knight’s Children’s Center” on Huntington Ave. The Home for Little Wanderers is relocating to Walpole, and the latest plan for its site is to tear the buildings down and put up a high-end apartment building. Curtis Kemeny, whose Boston Residential Group is planning the high-end apartment building, previously told the Gazette that the existing buildings cannot be reused due to their age and the difficulty of reconfiguring them. It’s worth pointing out that the proponents of historic preservation and the proponents of affordable housing are not always natural allies. Often as not, for example, in the case of St. Aidan’s in Brookline, finally converted to affordable housing in 2010, housing advocates come up against preservationists and others who don’t want to see changes made. The people already residing in those cities have enacted policies that have, in essence, built a wall around them. Limits on the size of buildings mean that fewer apartment units are built; demands that the needs of cars take precedence over the needs of people create vast parking lots that take up valuable land; zoning restrictions make it harder to create thriving neighborhoods with many types of housing and businesses. In his polemic, “The Rent Is Too Damn High,” Matt Yglesias notes while residents fight to preserve the character of iconic neighborhoods like Brooklyn’s Park Slope or Washington, D.C.’s Georgetown, those neighborhoods would be illegal to construct today. Fernholz argues that high costs of living, combined with rising college debt, keep people from making the move to one of the country’s historically magnetic cities, like New York. Forget Georgetown. More dramatically, there’s the height restriction on all buildings in Washington DC, which gets a lot of blame for that city’s rising rents. In the JP case (which, just to clarify, doesn’t involve affordable housing) the figurative keys to the bulldozers currently rest in the hands of the Boston Redevelopment Authority (BRA) after the Boston Landmarks Coalition (BLC) imposed a 90-day moratorium. So, JP-ers, keep an eye on the alphabet soup and ponder this one awhile. Photo shamelessly stolen from the Home for Little Wanderers’ incredible Flickr stream. If you like that one, check out the kids occupying this tree house on Halloween. The Thanksgiving turkey drive. Man, I could go on and on. The flight from Boston to New York would take one hour forty-five minutes. It was the mid 1920s: a happening time between world wars. The United State Postal Service had successfully proved its experiment in putting excess planes to work ferrying mail from coast to coast, so that the government felt confident putting its airmail routes out to bid to private aviation companies. An unknown Charles Lindbergh would fly mail between Chicago and St. Louis for one of those little firms. Meanwhile, another, Colonial Air Transport, launched in New York City by ex-air force pilo Juan Trippe, who later founded Pan Am, got its first contract in 1925. Colonial originally flew just a mail route between New York and Boston. 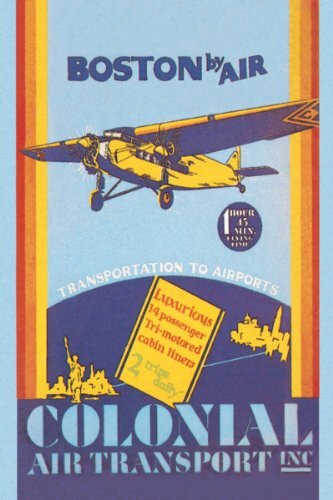 However, in 1927, the same year the small airline relocated its headquarters to Boston and Lindbergh captivated Americans with his flight across the Atlantic, Colonial began offering the first regular passenger service. Starting in April, Colonial’s planes, like the one in this photo by photographer Leslie Jones, flew steadily between Boston and New York. 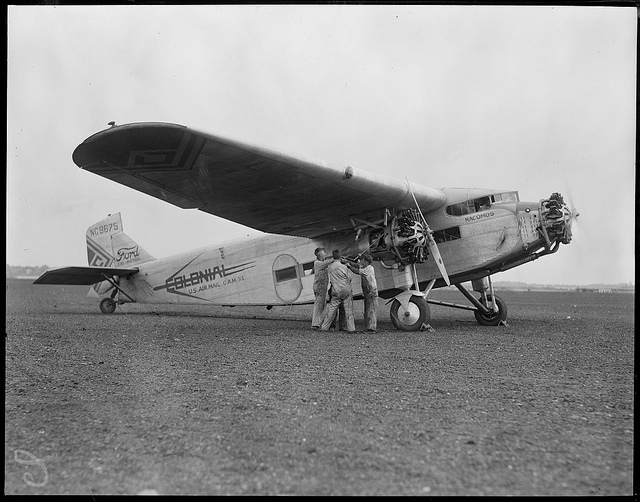 Jones, a Boston Herald-Traveler photographer, took this particular photo in 1929 at the East Boston Airport. Another company, AVCO purchased Colonial in 1930 and combined it into a network that eventually would become American Airlines. Photo: Boston Public Library/via Flickr. You can peek inside the airline’s time tables here. In 1812, William Croswell, an “early nineteenth century eccentric” – otherwise known for writing little-read, obscure books about astronomy, creating a well-received map of the stars (the first American star-map), and incurring debts to friends – was hired by Harvard to produce a new printed catalog for the library. The library contained about 20,000 books, and was arranged by donor of the volumes. Croswell apparently didn’t get on well with students, who played pranks on him including hanging a skeleton in the library. But he slowly and steadily progressed, until he had a list. He then began the task of putting it in a more logical order. Eventually in May of 1817 Croswell began cutting the list into strips, a task which took six weeks. Then he was able to arrange the slips under the appropriate headings. Croswell eventually got fired for taking too long to finish the catalog. But in 1840, librarian Thaddeus William Harris wrote that the Harvard Library should compile a slip catalog, listing all the collection’s titles on pieces of paper. Harvard College Librarian Thaddeus William Harris urges in his 1840 annual report that a “slip catalogue” be created consisting of the title of every work in the library on pieces of card 6 1/2 inches long and 1 1/2 inches wide. Library historian Kenneth E. Carpenter (who put together a comprehensive history of the library in 1936 [PDF]) gives Croswell the credit. Lists of a library’s inventory date back much farther, from writing on the walls to scrolls. Harvard at least claims their catalog is the first of its kind. The Encyclopedia of Library and Information Science says perhaps not and points back to Europe. The Harvard library was one of the first libraries to hire women, who hand-wrote many of the cards. One of the disappointing realities of historical signage campaigns is the signs themselves just don’t have all that much impact unless you know what you’re looking for. We expect them as part of any normal historical preservation effort, but a discreet metal plaque on a wall with some dates – it’s sort of anti-climactic.The backstory’s usually better told in detail, told aloud. At the same time, it’s a surprise to learn that the Sylvia Plath’s first residence doesn’t have a marker. No ‘Sylvia Plath lived, slept here.’ Nothing. The author of The Bell Jar and the book of poems, Ariel was born in a Boston hospital on October 27 of 1932. This blog is a not turning into a historic buildings blog in a here’s your obscure, picturesque Victorian of the day sense. Don’t worry. But for now, more on that house: It’s on JP’s Prince Street. The home’s a fairly non-descript suburban stand-alone with a porch, near the Arnold Arboretum. A convenient walk for Plath’s father, a Boston University botanist who studied bees. That would be different. See photos of all Plath’s homes throughout her life collected at Steinberg’s website sylviaplath.info. Thanks to him for the correction. Photo of a downtown fountain for thirsty horses via Boston Public Library’s Flickr stream. Would take one of these for people right about now. Henry Whitney, a Boston land speculator, and Charles Francis Adams, Jr (scion of the famous Adams family) built a trolley line to connect their suburban landholdings in Brookline with downtown Boston. Reports on the windfall profits that Whitney made on his property led to the rapid adoption of electric trolleys in other cities. The 1890 census estimated that trolley operation cost only $38,000 per mile, compared with $50,000 for horse cars. Between 1742, when horses were taxed for the first time, and 1841 there were roughly forty humans for each horse. By 1880 the ratio had dropped to twenty-five, although it was back up to forty in 1900 after the electrification of street railways…by 1920 Boston had fewer horses than in 1820. Interestingly, Atlantic Ave, where this fountain for parched draft animals is set up has seen a lot of clearance and reconstruction. The streetscape looks nothing like this today. 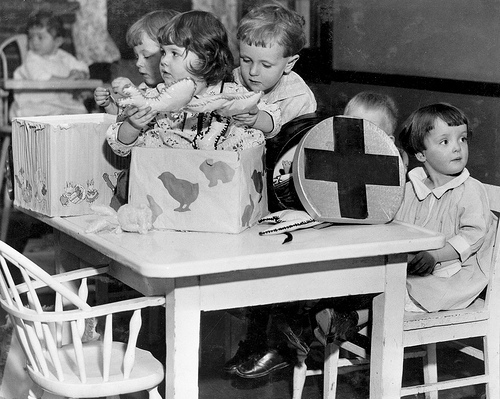 This 1922 photo is another by Leslie Jones, Herald-Traveler staff photographer.